Sciatica pain can be intense, preventing you from working, spending time with loved ones, and otherwise living your life. It has several potential underlying causes, although 90% of cases stem from spinal disc herniation. 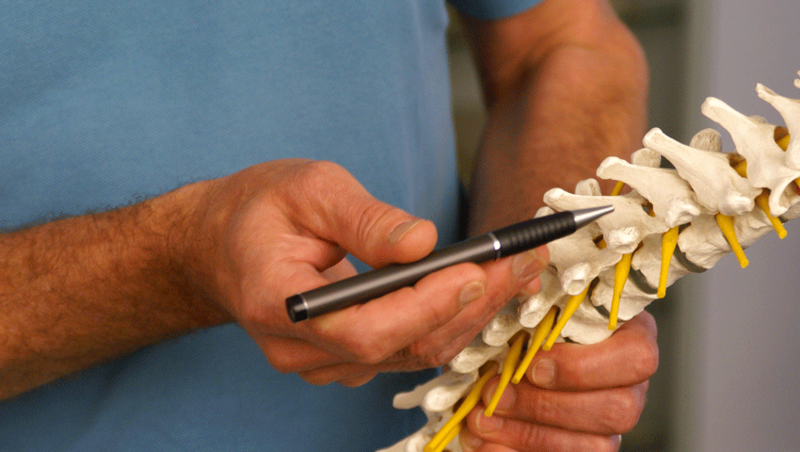 This presses on the lumbar nerve or sacral nerve roots, generating intense pain. Although many cases remit spontaneously over the course of weeks or months, the pain in the meantime can be almost unbearable. Treatment for sciatica is difficult but not impossible. Physical therapy, weight control, and NSAIDs can help, but you’ll get the most benefit from a properly managed chiropractic treatment plan. We’ve put together a list of 5 exercises you can do at home that can help reduce acute sciatica pain. Remember: exercises alone will not prevent sciatica or cure sciatica. However, with the right chiropractic treatment plan, you can see significant long-term results. That said, the right exercises can reduce pain in the short term. It might seem counterintuitive, but exercise is actually better for sciatica pain than bed rest. Without enough movement, your muscles become deconditioned and weakened, making you more prone to back injury and strain, exacerbating the pain. Exercise programs for sciatica can depend on its underlying cause, but will almost always feature exercises that promote core strength in the back and abdominal muscles. These 5 exercises can help relieve and prevent sciatica pain. This stretch helps promote lower back flexibility. Starting on your back with a cushion beneath your head, bend your knees while keeping your feet straight and your legs hip width apart. With your upper body relaxed, bend one knee up toward your chest, grasping it with both hands. Hold for 20 to 30 seconds. Designed to mobilize the hamstrings and sciatic nerve, this stretch begins on a mat with a cushion under your head and neck. With your knees bent and your legs hip width apart, bend one knee up to your chest. Grasping the hamstring, slowly straighten the knee while pulling your foot toward you. Hold for 20-30 seconds. Lie on your stomach, propping yourself up on your elbows. Keep your shoulders back, your neck long, and your back extended. Then, push down on your hands to arch up your back. Hold for 5 to 10 seconds. Standing up, raise one leg onto a stable object, such as a step or a sturdy chair. Keep the leg straight, with your foot flexed so that your toes are pointing straight up. Keeping your back completely straight, lean forward and hold for 20-30 seconds. Laying on your back with a small cushion under your head, bend your left leg and rest your right foot on your left thigh. Then, grasp the left thigh, and pull it toward you. Keep your hips straight and your tailbone on the floor. Hold for 20-30 seconds. Along with exercises and physical therapy, chiropractic treatment has been shown to produce improvement in sciatica symptoms. In one 2010 study, 60% of sciatica patients who received chiropractic care three times a week for four weeks experienced the same degree of relief as those who underwent surgery. If you’re struggling with sciatica pain, reach out to us any time at Intero Chiropractic. We’re always available for a 100% free consultation, along with a full neurological exam for only $20. For sciatica patients, chiropractic care can be a significant part of an overall regimen to manage and reduce pain during recovery. Sciatica can be extremely painful. Shooting pain throughout your back and your upper legs, weakness, and inability to live your normal life make sciatica pain extremely difficult to manage. Many sufferers of sciatica have turned to pain pills – ranging from low-dose aspirin to intense opioid painkillers. However, using painkillers to treat your sciatica is a mistake – a smart chiropractic regimen from Intero Chiropractic can provide all of the pain relief benefits of medication at a fraction of the cost – and for a longer period of time. Here are 8 reasons you should never take pain pills for your sciatica pain. The cost of pain medication beyond simple over-the-counter pills such as acetaminophen, naproxen, and aspirin is staggering. If you’re uninsured or your insurance doesn’t cover your medicine, a single pill of Oxycodone – a leading opioid painkiller – can cost you anywhere from $30-$50, making pain medication an extremely expensive treatment method for sciatica pain. Almost all powerful pain medications are opioid-based, using the same pharmacological substances as extremely addictive painkillers like morphine, and street drugs like heroin. Even using opioids temporarily can lead to addiction and extremely painful withdrawal symptoms. Pain medication will only help relieve your sciatica pain when you’re taking it regularly. If you ever run out of medication, forget to take it, or otherwise don’t have access to your medicine, your pain will come back with a vengeance. If your car’s heat gauge showed that it was about to overheat, would you just cover it up with a piece of duct tape and keep driving? This is exactly how pain pills work. They cover up the symptoms of back pain and sciatica, relieving you from the symptoms of your condition – but not offering any kind of long-term cure. In addition to the highly addictive properties that opioid-based painkillers have, these drugs have a ton of nasty side effects like nausea, disorientation, and even the danger of death or hospitalization if they are administered incorrectly. Even over-the-counter drugs like acetaminophen, aspirin, and naproxen can cause damage to your kidney or liver if taken at non-recommended dosage. Doctors are sometimes sponsored by pharmaceutical companies to push their products – their desire for a kickback may cause them to recommend a dangerous or expensive painkiller for your sciatica pain. Since your pain medication dulls your senses and relieves you of pain, you may not be able to tell if your sciatica or lower back pain is progressing or getting better, leaving you ignorant to the extent of your condition. You can’t take pain pills forever, especially if they’re powerful opioids like Oxycodone and other prescription painkillers. Eventually, you’ll have to resort to other measures to treat your sciatica pain. If you’re looking for a safe, inexpensive, long-term treatment that can help you relieve your sciatica pain, look no further than Intero Chiropractic. Our comprehensive spinal treatment plans include physical rehabilitation, stretches, and adjustments that can help you get relief from painful sciatica nerve pain at a fraction of the cost of pain pills prescribed by a doctor. Come into our Pleasanton, CA chiropractic office for a consultation today, and see how Intero Chiropractic can change your life by relieving you of the sciatica back pain that has been plaguing you for so long – without costly, dangerous pain pills or other treatments.